Figuring out to make for dinner is a struggle, even for someone like me who loves to cook. Since we have family coming into town for William's birthday party I've been trying to use up whatever is in our fridge to make room for party food. 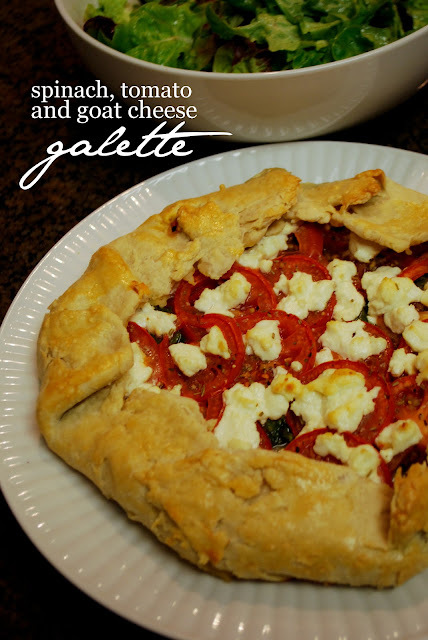 So, I whipped up my first savory galette using tomatoes, spinach and goat cheese and served it with a side salad. It was tasty and I am really excited to have my parents here. I haven't seen them since July and that's a long time! In a medium bowl combine flour, oil, salt and water. With a fork, stir to combine. Pour onto counter and knead for 1 minute. Cover with plastic wrap and let sit for 30 minutes. It should look somewhat dry and crumbly but should hold together. Preheat oven to 400 degrees. Line a cookie sheet with parchment paper. Turn dough out onto surface and lightly bring it all together with your hands (adding more water if too crumbly and a tiny bit of flour to make it less sticky). Roll the dough out into a 14 inch circle onto the parchment paper. Brush the edges with a bit of the egg wash. Top with the spinach leaves, leaving a 2 1/2 inch border, then the tomatoes. Sprinkle a bit of Herbes de Provence on top of the tomatoes and then sprinkle with goat cheese. Drizzle with a bit of olive oil and salt and pepper. Fold dough border over filling and brush with the egg wash. Bake until crust is golden brown, about 35 minutes. Looks yummy! I should have YOU look at the leftovers in my fridge... I'm not that creative. that is one thing i've always admired about you, you can take a few simple ingredients and whip up something delicious + absolutely beautiful. everything you put your hands to comes out looking fabulous. Yay! So glad I found you :) Your blog is adorable just like you! The galette looks delicious. that looks SO GOOD. i love goat cheese. must try it. Made this for dinner tonight and absolutely loved it. Even my husband, who can be a bit wary of non-meat foods commented multiple times how much he enjoyed it.